Orlando was once heralded as the key swing city in the key swing state, nestled at the center of the country’s key swing region, the I-4 corridor, where many believed the presidency would be decided. In 2000 and 2004, the sentiment was understandable. No populous Florida County was closer to the state average than Orlando’s Orange County in 2000, and Kerry won Orange County by just 815 votes out of nearly 400,000 in 2004. 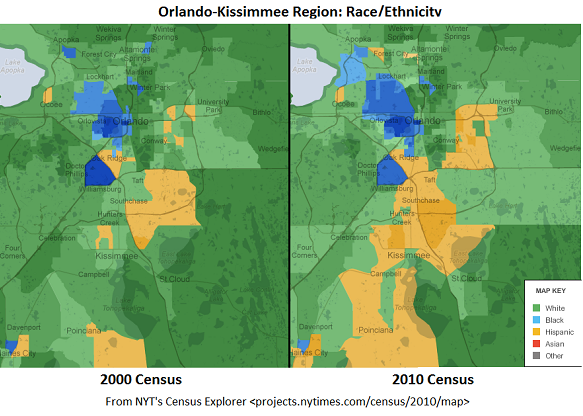 But over the last ten years, profound demographic changes have transformed the fast-growing Orlando-Kissimmee region. Nearly all of the region’s new residents are non-white, and the Hispanic population nearly doubled, with Hispanics now representing 27 percent of the population in Orange County and 45 percent of residents in Osceola County, home to Kissimmee-St. Cloud. Unlike South Florida’s predominantly Cuban population, Orlando-Kissimmee’s rapidly growing Hispanic population is mainly Puerto Rican and far friendlier to Democratic candidates. African Americans also flocked to the area and now constitute more than 17 percent of the region’s population. These trends were most acutely felt in Kissimmee-St. Cloud, where the Hispanic population surged by 141 percent and the African American population increased by 121 percent in Osceola County. Today, a majority of residents in both counties are non-white, with whites representing just 45 percent of the area’s population. As you can see from the map, Hispanics (in orange) now represent the largest group across large swaths of the Orlando-Kissimmee metropolitan area, with relatively few overwhelmingly white enclaves (green) remaining on the eastern side of Orlando and across the predominantly white countryside. In 2008, the Obama campaign capitalized on these demographic trends and the region vaulted decidedly into the Democratic column, with Obama winning 59 percent of the vote, up from Kerry's 49 percent. So long as Obama maintains his grip on Hispanic voters, Obama is likely to maintain his big lead in the Orlando-Kissimmee area. Both campaigns will still compete aggressively to maximize their share of the vote, but Romney’s best case scenario is meaningfully worse than either of Bush’s showings. Twelve years ago, such a large advantage in Orlando-Kissimmee would have easily given Al Gore the presidency. Although it might be tempting to assume that Obama’s edge in the Orlando area gives him an advantage in Florida, much of the rest of the state has shifted toward Republicans with respect to the country. In the culturally Southern stretches of central and northern Florida, Obama performed much worse than either Kerry or Gore. Seniors have never been one of Obama's strengths, and few states hold more elderly voters than Florida. Since Obama is unlikely to reclaim lost ground among culturally southern whites or reach Gore-Lieberman levels among elderly transplants along Florida’s Gold Coast, a dominant performance in Orlando is necessary but not sufficient for Obama to carry the state.